The Book Arts Program (BAP) supports and participates in the Modular MFA Program, offered through the Creative Writing Department. This unique program provides graduate students with the opportunity to enrich their studies in Creative Writing with a focus in Book Arts. The Modular MFA requires six credit hours of thesis research and nine courses, including four creative writing workshops, one theory and practice in the genre of the student's thesis, and at least four courses to fulfill the modular component of their coursework. 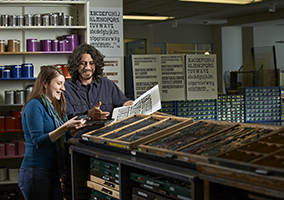 Book Arts classes that fulfill the modular component include Letterpress Printing, Bookbinding, Artists' Books, Book Arts II (offered through the Art Department), and Typographic Communication and Book Design (offered through Architecture and Planning). Most Book Arts Program classes take place in the Book Arts Studio and classroom. The expansive and well-organized studio, housed on the fourth floor of the J. Willard Marriott Library, is impressively equipped with eight cylinder proof presses, three clamshell presses, and two handpresses; large collections of metal type and zinc cuts; and an array of bindery equipment including board shears, guillotines, nipping presses, and hand tools. Students focusing in Book Arts through the Modular MFA Program enjoy the benefits of this space, a close-knit creative community, and faculty dedicated to providing a strong foundation in technique and craft, while supporting the academic and conceptual concerns unique to each creative writing student. Additional courses in architecture, communications, English, and art have also been preapproved to fulfill the modular requirement. Students in this program are encouraged to seek out graduate and upper level undergraduate courses relevant to their creative and research interests in departments outside of English (proposed courses require pre-approval by the Director of Graduate Studies and the Director of Creative Writing). Applications for the Modular MFA are accepted and reviewed by the Creative Writing Department. For details about how and when to apply, please visit the Creative Writing Program’s website. Potential students with questions about the Book Arts Program and the Book Arts Studio should feel free to contact Marnie Powers-Torrey and/or Emily Tipps.